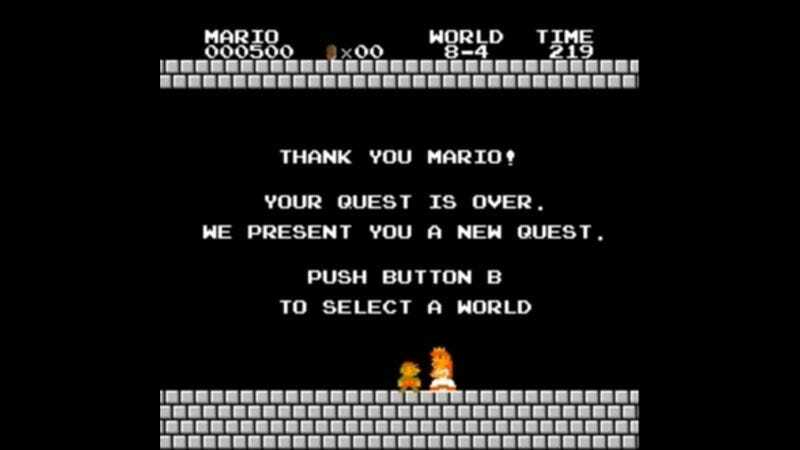 A YouTube user scored just 500 points in an entire game of Super Mario Bros.
By not killing any enemies, picking up any coins or powerups and hopping on the end of level flagpoles at the last second, YouTube user NotEntirelySure has completed a 500 point game of Super Mario Bros., the lowest possible without using a continue. On its face it sounds incredibly dull, but the nine-minute run (which only edits out waiting to jump on the flagpole) is an incredible watch. NotEntirelySure pulls off a ton of mindbending stunts to keep Koopas alive, the most amazing of which is a jump in 8-1. The jump was a toughie to make, as NotEntirelySure explains in the YouTube comments: “The timing of the liftoff, the duration of holding the jump button, and the timing of the wall jump are all frame perfect. NES games run at 60 frames per second, which means all the necessary inputs need to be timed within 1/60 of a second. In addition, the starting position before running I used not only has to be on the right pixel, but also the x sub-pixel has to fall within a certain range (technical stuff blah blah blah). In short, it's a pretty annoying jump.” In many ways the pixel perfect accuracy required to never once hit anything but the ground is more entertaining to watch than any high score run could be. We’re sure all those Goombas are thankful as well.